If you are a chocolate lover, December 16th is your day! It’s National Chocolate Covered Anything Day! 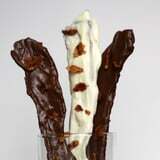 Make This Chocolate-Covered Treat For Your Bacon-Obsessed Friends. Preheat oven to 375°F. Place bacon on a baking sheet lined with parchment paper or a half sheet pan fitted with a cooling rack. Bake in the oven until bacon is cooked (15 minutes for soft bacon, 20 minutes for crispy bacon). Let bacon cool on the pan for 5 minutes then transfer to a plate lined with paper towels. Cover another baking sheet with parchment paper. Using tongs, carefully dip half the bacon into the melted white chocolate turning to coat all sides in chocolate. Transfer to the clean sheet of waiting parchment paper. Repeat with the remaining slices of bacon, dipping them in the melted dark chocolate. Reserve a few slices of bacon, crumble them, and sprinkle them atop the dipped bacon pieces. Let chocolate set at room temperature or refrigerate until chocolate is hard. Consume within a few days.